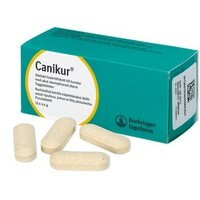 Canikur Anti Diarrhoeal Tablets are a palatable and effective treatment for the maintenance and support of digestive functions in dogs, which may help with digestive upset (diarrhoea). The tablets can also be used as a bulking agent to help chronic analgland problems. If the dog's condition does not improve after 2 days or if the dog's demeanour deteriorates at any time, contact your veterinary surgeon. Quite simple to write this review. These tablets work! My four month old Springer was having trouble with her tummy for a couple of days, so I thought I'd give these a go. I starved her for 24 hours after beginning treatment with the tablets, then gave her small amounts of food until she was back to normal. Within 2 days of starting the treatment, she was fine. And, she went wild for these tablets. No need to force feed her, as she loves them! What more can I say? I'm ordering some more, just so I have some in my cupboard for if I need them again. Following on from my last review, my Sprocker puppy is now 2. Both she and my 5 year old Springer had very poorly tummies this week. The younger dog had it first and then we were greeted by a huge smelly cow pat on our cream carpet from the older dog. Fortunately I always keep Canikur in stock and after 2 days on the tablets and the egg/rice diet both dogs completely recovered, thus saving me nearly £100 with consultations and tablets at the vet. Everyone should keep a packet ready for such an occasion! Just checked price on other site these are almost £20 cheaper,I swear by the pills for my labradors who eat anything they shouldnt,saves me a fortune in vets fees. These are great! We bought them for one of our dogs, which has a sensitive tummy and suffers from diarrhoea from time to time, and these sorted him out completely in a couple of days. Will place a second order to keep them handy!! I have had cause on multiple occasions to use these tablets on my 3. So much easier than trying to make them eat the paste which is always a battle resulting in me being covered in more than the amount actually in their mouths. The tablets are highly palatable and be handed to them to eat directly without having to hide in meat which means I can then fool the dogs into thinking they are having a treat and not a tablet! They work well too, helping to get the stools formed again. Third order made on these tablets. They work brilliantly on my young labrador who came to me as a rescue. He suffered from a runny tummy almost since day one. These have sorted him completely. Excellent product. These tablets are wonderful. I used them for my old dogs on several occasions but have recently had a Sprocker puppy. Unfortunately she eats anything in sight and consumed a quantity of sheep manure last week resulting in a very runny tummy. After 2 days of Canikur and a diet of chicken/fish/egg and rice/pasta she has completely recovered, saving me £25 at the vets. I always keep a packet handy. Thank you Vet UK. My dog has been loose for nine years, no luck at the vets but on these tablets he is sorted! He has been on them for two years and is fine now! Great product and dogs enjoy taste. Had these prescribed by my vet originally but cheaper from VetUK - good product as long as dog does not have any other symptoms. I am about to place a second order for these tablets, they are great for my dogs when they have upset tummies!! These tablets are great for getting your dog's digestive system back on track. I have had to order them twice now, last August and recently January 2010 for one of my shepherds as his tummy can be a bit susceptible to things out of the ordinary, most recently for eating too much snow !!!!! The tabs go down no problem, so must be palatable, and the price from Vet UK is by far the cheapest on the net, and no doubt much cheaper than the local vet !!!! Plus free postage too, you can't go wrong ! Highly recommended !